From April 2010 onwards, I had my first internship abroad. It was also the first time I had to live on my own, so you could tell it was quite challenging for me. When I arrived in Hong Kong, I only had the names of a couple serviced apartments in Wan Chai and Causeway Bay in my note book and hotel reservations for just two nights. I found out that one of the serviced apartments was a street away from the company I would be working at, so I visited the one in Wan Chai first. I knew beforehand that the pictures shown on the website should be taken with a grain of salt. So when I actually saw the rooms myself, I wasn't really that disappointed. It was what I wanted: a furnished room with just enough space for one person to live in with my own in-room bathroom and kitchenette. 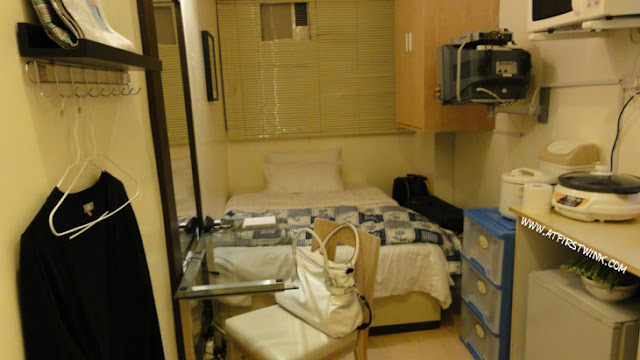 The rent was HK$6500 per month (about 600 euros including fast broadband internet, TV, electricity, and water.). They would also clean your room once a week and take out the trash for you, but I declined as I don't like the idea of people going through my stuff, while I am away. It was manageable for me to do those tasks myself. The front gate had an electronic number lock and the door to the room has two locks for which you need two different keys to open. There are however some things I learned that you need to check before you decide to take a room and sign a rental contract. I will also cover some things to be careful about. 1) Check if the air conditioning does not make too much noise. The difference between the rooms that viewed were quite noticeable, but I took the room with a slightly louder noise, because the lay-out of the room was better than the one with less noise. It had a bigger closet and a broader kitchen table. But boy, do I wish I took the other room. I really thought the noise wasn't that bad, but when you sleep and you are not used to hearing anything, the sound of the air-con really bothers you the whole night. 2) Check if the toilet flushes by flushing it a few times. My toilet did not flush the first day I stayed there. Luckily, I was not doing the number 2 when that happened. ^_^ After calling the guy from maintenance, he came within 15 minutes. They cannot be reached after working hours (17:00), so I was glad he could come by, as it was 16:30 when it happened. Another lucky thing was that I watched closely how he fixed the toilet. Two days later, the toilet didn't flush again in the middle of the night. I remembered how the maintenance guy fixed it, so I tried it myself. I was surprised at my skills, because I managed to fix the toilet the other 20 times it broke during my three month's stay too. 3) Check if the kitchen sink has hot water. I thought this was pretty normal, but my room didn't have it. I had to boil water in the electric water kettle first and use that water mixed with the cold tap water to wash my dishes. This was not always convenient. The bathroom did have warm water, but it is not that great to get a bucket of warm water from the bathroom first, before you can do your dishes in the kitchen area. 4) Check out the direct surroundings of the room. Right outside of my room was the fire escape stairs, which is nice since the rooms don't have smoke detectors and it is an old building. But the door leading to the fire escape stairs is often left open, which is quite scary, since I kept thinking that strangers could get in and hide behind the door. My room was located far away from the other rooms, so I didn't have problems of noise coming from my neighbors, but the other rooms that were located right next to each other could have them. There was also a window in the very narrow hallway to my room, which makes it less stuffy. 5) Do not automatically open the door when someone knocks on it. This was the advice I got from my aunt. I really didn't think too much of it. However, when you are a girl living by yourself and someone knocks on the door in the middle of the night, while you don't expect anyone to visit you, it can be pretty scary. The good thing is that most front doors in Hong Kong have a security chain, which allows the door to only be opened for a little bit. This should be put on the door at all times. I even started to develop the habit of automatically locking everything on the door, right after I get home. There is also the possibility of former tenants to have copies of the door keys, so it is better to be on the safe side. 6) See what the neighborhood is like. Right next to the building I lived in, was a big Chinese restaurant. Because of this, there were people walking on the street throughout the whole day. This gives you a better sense of security in comparison to a street with small shops that all closes at 17:00 or 18:00 and becomes completely empty, when it gets dark. There was also a tram stop a street away from where I live, which stops at the Wanchai metro station. This is really good, because when you do not know how to speak and read Chinese that well, the tram and metro are the best public transports to take. The Starbucks, Neways, McDonalds, Burger King,Yoshinoya, Genki sushi, Mei Sum MX, Ajisen ramen, dry cleaners, hair salons, household goods stores, 7-eleven convenience stores, supermarkets, bakeries were also all in close walking distance. 7) Do not sign a long-term rental contract, if it is not necessary. You don't know what may happen. Suddenly, more inconveniences could arise that you could not predict beforehand. It could be anything, from the mattress that is too hard to not working toilets. Just rent one month at a time, even if you are planning to stay for a longer period. They might say that a lot of people are after your room and that you need to pay all the rent upfront to make sure that you can stay there for a longer time. Still, you don't have to feel pressured to sign the contract. If the worse come to worst, you can still find another apartment/room to stay at through the new friends that you have made during that month or via your nice colleagues. 8) Make sure your privacy is protected. Some rental companies have extra keys to your room and they can take interested/future tenants to view your room, while you are still renting/living there. They could also have camera's installed in places that are not mentioned to you, such as in the hallways, elevators, staircases, and so on. Although these are here for your security, it feels a bit uncomfortable that your every move is followed without them telling you or that they could possibly film parts of the inside of your room, such as through the windows. That's why I like it when some elevators have a small sticker telling you that it is under video surveillance and where the camera is located. 9) Try to not have valuable items lying around. You might feel more at ease as it feels as your second home, but even in hotels, random people with keys to your room like cleaning ladies and repair men could take something from your room. When something has gone missing, they can often blame you for carelessness. I might be a bit too paranoid, but I always put my laptop away in my large locked suitcase, when I leave the (hotel) room. It is easier to hide a small laptop in a backpack or bag to get it out of sight from security cameras than a large roll away suitcase. Or they actually have to break the lock/suitcase and that's a bit too much for them to do without knowing the actual contents of the suitcase. Although the odds are small that something actually gets stolen, the vacation pictures and other files stored in my laptop are irreplaceable. I don't want to risk it. My room in Hong Kong. It was small, but sufficient for my needs.